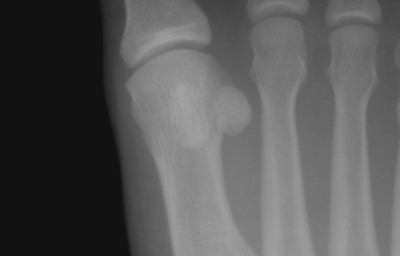 Sesamoid derived from Latin "Sesamum", meaning "sesame seeds" (due to small size of sesamoid bones). These bones display high degree of variability in size, location, penetrance and anatomical connection to the main skeleton across vertebrate species. Sesamoiditis is a chronic injury, caused by frequent pressure and results in irritation and painful inflammation of the surrounding tissues. The sesamoid bones are embedded in tendons, either in close relation to joint surfaces and forming an integral part of the articulation as in the patella and the hallux and pollicis sesamoids, or where tendons are sharply angled over a bony surface. The sesamoids act together as a fulcrum to increase the angle of application and improve the efficiency of the flexor hallucis longus tendon’s function. This also stabilizes the hallux. The sesamoid provides both protection and shock absorption for both the joint and tendon. The Great toe is most commonly affected which contains 2 sesamoid bones, the tibial and fibular sesamoids. Pathological conditions involving the sesamoid are rare and usually of post-traumatic or degenerative etiology. There are different causes of sesamoiditis, for instance damage to the sesamoid bones, a deformation of the meta-tarso phalangeal joint or gout. Walking on high heels or Boot marching. People with higher arches, flattened arches, bony feet. Increased in body weight or training load. Individuals who have a tendency to run on their forefoot. The size of the sesamoids (the bigger, the higher the risk). High impact sports (volleyball, running, gymnastics,etc). In case of sesamoiditis, there are no bruises or redness visible, but this disorder is associated with local pain and swelling, which results in problems with the movement of the hallux . This pain can be a dull aching type or a sharp throbbing type. This causes a limitation in the dorsi-flexion and the plantar-flexion of the first meta-tarso phalangeal joint. The pain begins mildly that gradually worsen when the strained activity is continued. In the case of sesamoiditis of the hallux, the pain is located in the ball of the foot, especially on the medial side. The sesamoid bones are also very sensitive. The location of the tenderness corresponded exactly to the location of the medial sesamoid bones. The problem may be situated in both sesamoids, although the medial one is more frequently involved. The diagnosis of sesamoiditis should be based on the symptoms. These are inflammation and swelling, located at the infero-medial aspect of ball of the hallux. This causes painful movement of the hallux. However, clinical reproduction of the intensity of the symptoms are not always successful, which may contribute to an inconclusive diagnosis. The problem is that sesamoiditis may be associated with bursitis, tendinosis, and tenosynovitis. When a stress fracture is suspected, a bone scan or a CT-scan are seen as more reliable in confirming the diagnosis than X-ray and MRI. The second method to support the diagnosis of sesamoiditis, is the use of the Passive Axial Compression Test (PAC). This maneuver should be specific for the sesamoids as all other soft tissues about the plantar aspect of the first metatarsophalangeal joint are in a relaxed position. This test is helpful for the physiotherapist to perform his diagnosis of sesamoiditis. During an examination physiotherapist will look for tenderness at the site of sesamoid bones. To do this physiotherapist may manipulate the bone slightly or ask patient to bend and straighten large toe and look for intensified pain. Damage to the sesamoids, such as fragmentation, may result into inflammation. Therefore, sesamoiditis can mimic tenosynovitis and to optimize the patient’s care, the clinician should be aware of this. Also bursitis and tendinosis have similar symptoms. As mentioned in the diagnostic procedures the passive axial compression test (PAC) can be used as an outcome measure. Also imaging methods, such as a bone scan and ST-scan are reliable outcome measures. The initial management for sesamoiditis is conservative. This includes rest in combination with ice and the use of padded insoles to reduce pressure on the affected zone. The patient should take NSAID’s to reduce the swelling or should receive local corticosteroids injections in the metatarsophalangeal joint. Specific therapy for gout has to be given if this appears to be the cause. Usually the treatment of sesamoiditis is noninvasive, but a Sesamoidectomy is recommended when the conservative therapy fails and symptoms persist for more than 4-6 months. Video of Fibular Sesamoidectomy here below. For the physical treatment of sesamoiditis we have to make the difference between Non-surgical rehabilitation and Post-surgical rehabilitation. As mentioned earlier, the physiotherapist will recommend wearing soft shock absorbing soles that help away pressure on the sesamoids. During non-surgical rehabilitation, the physiotherapist applies treatments to the painful area to help control pain and swelling. These treatments involve the use of Ultrasound, Moist heat and soft-tissue massage. Sometimes the treatment also includes Iontophoresis. For faster recovery, the hallux may additionally be padded, strapped, or taped to immobilize and provide protection. The treatment after a surgery begins with wearing a cast for up to four weeks. During that period, absolute rest is recommended. After four weeks the patient wears a short walking cast for another two months. Afterwards active exercises can be started. ↑ Goldberg I, Nathan H. Anatomy and pathology of the sesamoid bones. International orthopaedics. 1987 May 1;11(2):141-7. ↑ Patrick DeHeer DP. A Comprehensive Guide To Reviving The Sick Sesamoid. Podiatry Today. Choices. 1916 Jan 29;10:42. ↑ 3.0 3.1 3.2 Lang CJ, Lourie GM. Sesamoiditis of the index finger presenting as acute suppurative flexor tenosynovitis. Journal of Hand Surgery. 1999 Nov 1;24(6):1327-30. ↑ 4.0 4.1 Wakhlu A. An uncommon cause of great toe pain: sesamoiditis. J Indian Rheumatol Assoc. 2004;12:131-3. ↑ 5.0 5.1 5.2 Casillas MM, Allen MA. The passive axial compression (PAC) test: A new adjunctive provocative maneuver for the clinical diagnosis of hallucal sesamoiditis. Foot & ankle international. 2001 Apr;22(4):345-6. ↑ Saxena A, Krisdakumtorn T. Return to activity after sesamoidectomy in athletically active individuals. Foot & ankle international. 2003 May;24(5):415-9. ↑ Biedert R, Hintermann B. Stress fractures of the medial great toe sesamoids in athletes. Foot & ankle international. 2003 Feb;24(2):137-41. ↑ Lee S, James WC, Cohen BE, Davis WH, Anderson RB. Evaluation of hallux alignment and functional outcome after isolated tibial sesamoidectomy. Foot & ankle international. 2005 Oct;26(10):803-9.